A few days ago I wrote about my fitness goals. I’ve always felt that it’s extremely important to have goals and be actively working towards them. Having goals keeps a person from feeling stagnant, from settling. But here’s the tricky thing about having goals…it’s easy to get so caught up reaching your goals that you forget to be present and thankful for what you’ve already accomplished. Here’s a recent example from my life. I moved into my apartment about two years ago with a roommate. I love my apartment. It’s the first place I lived in for over a year after my post-college-move-around-a-lot phase. It has an adorable brick wall behind the stairway. It’s the first place I bought nice furniture for instead of hand-me-down furniture and decorated all by myself. 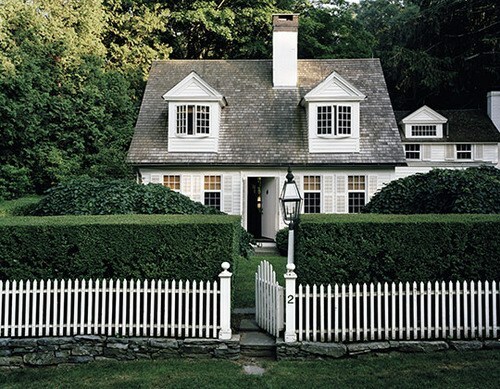 I’ve always loved that it has two stories so it feels bigger than your average apartment. It’s where I lived while I was really finding out who I am. Then, about a year ago my roommate moved away and Brandon moved in. I grew to love it even more as it became ours. Then a few weeks ago, Brandon mentioned that he wants to buy a house. We started thinking about moving away, and looking at homes online, and in the past few weeks we’ve talked about little else. Suddenly, my apartment seemed less appealing. It felt small and cramped. I started to resent the expensive monthly rent. I hated that we live in such close proximity to neighbors and that it’s not really ours, but owned by someone else. My mindset shifted, and though my apartment remained the same as the apartment I have always loved I was unhappy with where I was in the moment. Though this is a small example of balancing goals with living in the moment, I think it’s a good reminder to not let my goals get in way of my enjoyment of the present. Even though I don’t own a house yet, I can still feel bliss and find balance in my apartment. It’s great to keep my goals in mind, but it’s not beneficial to think “I’ll finally be happy when I have X.” I know that when we’re living in that house, there will be times I look back at my apartment and yearn for the feeling I had when I lived there. So while we’re saving for a house, I will continue to find little joys in my apartment and savor the moment. Bowling counts as exercise, right? When Brandon and I first met and started dating, both of our social lives revolved around hanging out with friends at bars. Catching up over a beer (or two, or three) was the norm. I consider myself a pretty social person, and love meeting up with friends throughout the week and weekend to balance work and time spent at home. I found myself at a point where I was drinking far too much alcohol during the week, which I know was affecting my health negatively. Slowly, Brandon and I started taking steps to get healthier (and save money!). 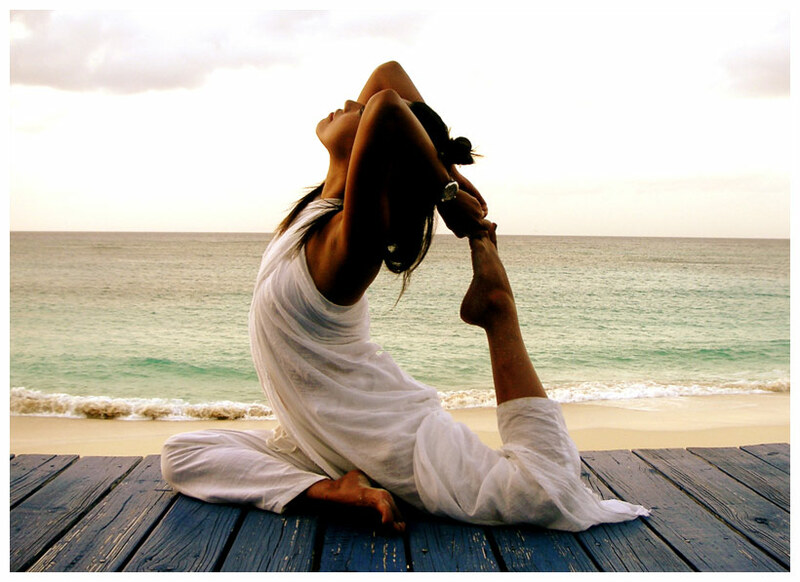 We joined a gym, started eating out less and began cooking more healthy meals at home. The hardest change of all was to drastically reduce our drinking. It wasn’t difficult because we missed alcohol per se, but because drinking is the social activity of choice among our group of friends. We quickly realized doing the standard bar meet-up while being the only ones not drinking was too difficult. Instead, we’ve tried to find other activities that will be fun sans alcohol. We’ve had lots of game nights and bowling nights, and we’re looking for more fun alcohol free activities. Since we’ve been spending a lot of time at home in lieu of going out to bars when Brandon’s brother invited us bowling Wednesday night we decided it would be a fun way to break up the week. I had planned on going to the gym in the evening, but sometimes you just need time to socialize! It’s all about balance, right? Before we left for the bowling alley we ate one of our favorite snacks. 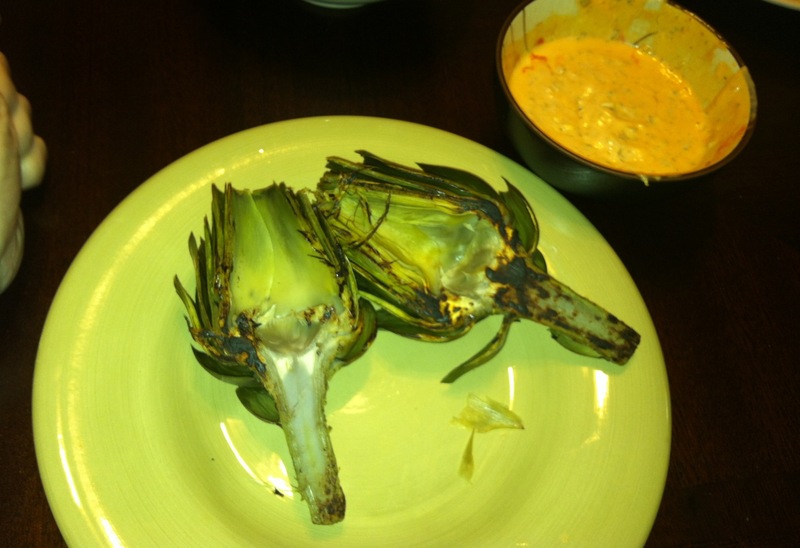 Grilled artichokes! The sauce on the side is a mix of mayo, sriracha and capers (sounds weird but it’s so good!). 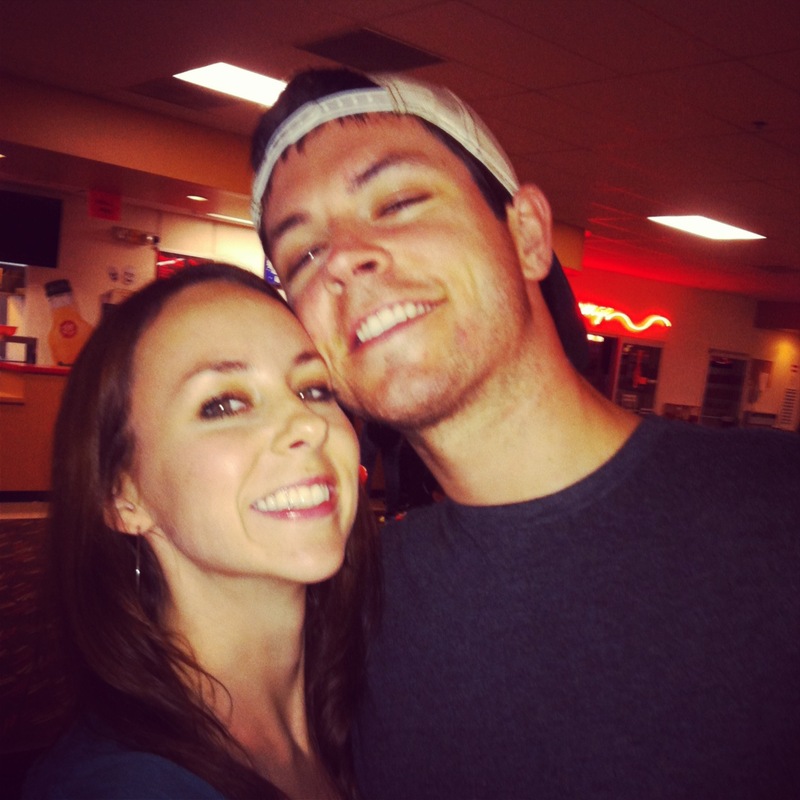 We headed up to the bowling alley to meet Brandon’s brother Mike, his girlfriend Abby, and a few of Mike’s friends. 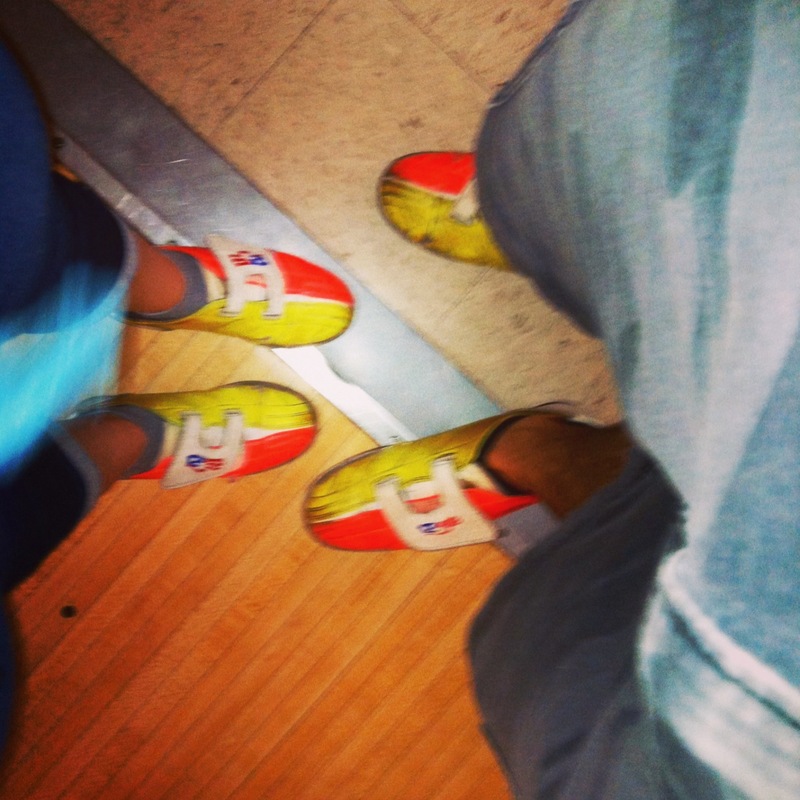 I must say, the shoes at the bowling alley near Mike’s house are not nearly as nice as the ones near ours. But they’re neon, at least! My bowling game is improving and I broke 100 again. We played two games and had fun chatting with Mike and Abby. I was planning on getting up early in the morning to squeeze in a workout, but after getting home late I decided sleep was worth it. I think it was a good decision, but I will definitely be going this evening.